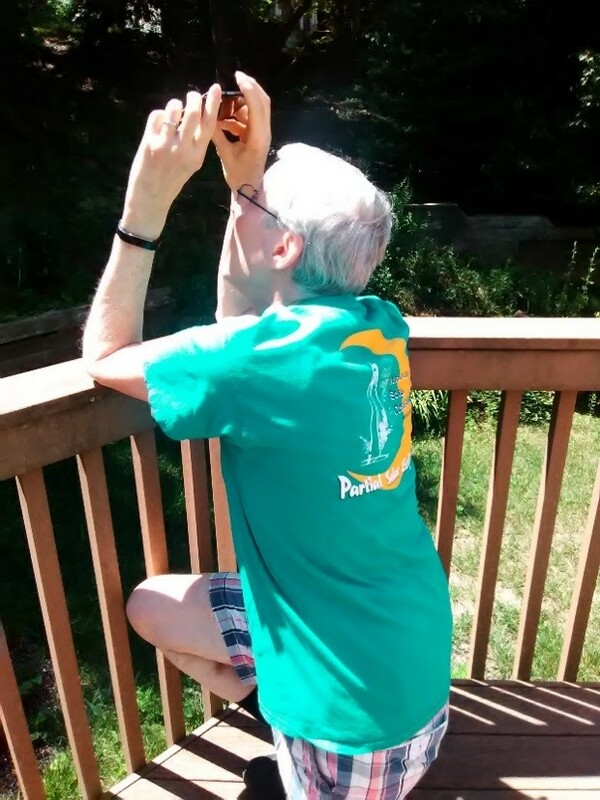 The simplest way to record the eclipse with a smart phone is to just hold the phone over your head, aimed at the Sun, and record. If you do only this in the graze zone, and carefully document your geographical location, you have made an observation that is valuable to the International Occultation Timing Association (IOTA). But your observation will be of more value if you accurately time it; see the timing section below. Some of these procedures are illustrated with this YouTube video ; it shows some helpful hints, such as steadying your arm holding the camera against the top of a low fence (as shown in the figure) or other object, perhaps the roof of your vehicle. Even better would be to increase the magnification of your recording using an inexpensive smart phone telephoto lens, described at the bottom; that will allow you to magnify the image more than the 4.0x maximum zoom that’s built into most smart phone cameras. Note that most smart phones use digital zoom, rather than optical zoom. With digital zoom, you gain no resolution, you only lose field of view, so in that case, it’s probably best not to use zoom. Remember this when you view the YouTube videos shown here; those were made before this was realized, so the 4.0x zoom shown in them, made with Android MAXX phones that have only digital zoom, is not recommended. Some zoom may be useful, for you to better see the eclipse, and possibly to mitigate blooming while the Sun is relatively bright, but for the recording, it shouldn’t make much difference, unless your smart phone actually uses optical zoom. Some smart phones that have optical zoom are Altek Leo, Nokia Lumia 1020, Samsung Galaxy S4 Zoom, Samsung Galaxy K Zoom, Asus Zenfone Zoom, and iPhone 7/7 Plus. If you are using one of these, or possibly another smart phone that the specifications show has optical zoom, you should use the maximum optical zoom possible to image the eclipse. Some of these may in addition have digital zoom for additional magnification, but you don’t want to use that, if it’s available. Documenting your geographical position: We need to know where you observed, to within an accuracy of about 20 feet. The documentation of your location should be done at least 20 minutes before the eclipse, or you can do it 2 or more minutes after the total eclipse, before you leave your site. Don’t try to do this along with a time calibration shortly before the eclipse, as shown in some of the videos; in practice, that unnecessarily complicates the process and can even lead to failure at the critical time by trying to switch between location (GPS) and timing apps on your smart phone. By documenting your location well before the eclipse, or after it, you eliminate this risk. Probably the easiest way to document your location is to just take a few still pictures within 10 feet of the location where you plan to observe (or where you actually observed, if after the eclipse), preferably augmented by counting paces from a feature that can be identified on aerial photography, such as the “satellite” views on a Google map or with Google Earth. Good features to use are the center of a street intersection (with distances paced along and perpendicular to one of the streets), the edge of a building, or even a telephone pole. If your smart phone has “location tagging” enabled, that’s all you need to do; your image file(s) of the location will include your accurate coordinates in the image “metadata”. You should verify that location tagging of your pictures is enabled; you can see that by looking at some of your past smart phone images on your PC; right-click on one of them to see a menu, select “properties”, and in its menu, select “details”, and near the bottom of that should be a section called “GPS” that gives the smart phone’s latitude, longitude, and altitude (above sea level, apparently in meters) when the picture was taken. If this GPS section is not there, then location tagging is not enabled on your smart phone, and you should enable it, and then take some pictures and verify that the GPS section is in the details of the new pictures. On my Android, the location tagging is on a semi-circular menu that can be found by swiping a finger from left to right when you are in camera mode; moving down on that menu, I have an upside-down drop symbol that is the location tagging symbol; touching it toggles, either enabling (the section of the semi-circle is turquoise when it is enabled) or disabling (then the section turns gray) it. But the way this camera menu is displayed, is different on different phones, even Androids with different operating systems. If for any reason, you can’t enable location tagging of your smart phone pictures, or can’t tell whether or not it is enabled, then I recommend determining your location with a free GPS app that gives directly your latitude and longitude, which can be written down; we need it to the nearest 0.1”, 0.001’, or 0.00001°. The recommended app is GPS Test for Androids; do NOT get the similar app called AndroiTS GPS. For iPhones, Google Maps or Scout GPS are probably sufficient. Displays of the GPS Test app are shown in some of my YouTube videos, but you can ignore that part of the videos as long as you have location tagging on your pictures, and you should NOT try to use GPS Test (or another GPS app) shortly before the eclipse, as shown in those videos. Timing your video recording: Unfortunately, cell phone time can be in error by 10 seconds or more, so it can’t be used; we prefer timing to 0.2s accuracy or better. Smart phones document the time in the picture or video (start time of the video) metadata, but usually only to the nearest minute, and it just uses cell phone time. Maybe by the time of the 2024 total solar eclipse, cell phone time will be made accurate, and the smart phone videos time-stamped to better than a second with it, in which case, the time calibration described below won’t be needed, but we don’t have that yet in 2017. One way to time-calibrate your video is to touch the video camera symbol to start recording at a time 90 seconds before central eclipse, using an accurate time source (such as an accurate time app display on a 2nd smart phone) to know when to do it. This is what’s recommended on the eclipsetours.com Web site for the effort at Minden, NE (starting the recording at an even minute), and it’s certainly better than no calibration, it should allow timing to better than a second. But I prefer the calibration technique shown in the YouTube video, where we want you to start your smart phone video recording about 90s before central eclipse, first recording for 5 to 10 seconds, an accurate time source; then while keep recording, record the eclipse; then 60 seconds after the central eclipse, record another 5 to 10 seconds of the accurate time source, before stopping your continuous recording. An accurate time source can be an “atomic” self-setting clock or watch (it should display seconds as well as hours and minutes); these devices were common 20 years ago, but now, they are harder to find as almost everyone relies on cell phones for time, which aren’t good enough by themselves. Another accurate source of time is from a short-wave radio (if you have one), from WWV at 10.0 and 15.0 megaHertz. Finally, Web sites such as www.time.gov provide accurate time, if you can video record a laptop computer screen, but most won’t have that at their observing site. If you don’t have any of the accurate time sources just described, there are free accurate timing apps for smart phones, but then you need two smart phones (which is partly why IOTA recommends two people at each station), one called “A” for displaying accurate time (with the app), and the other “B” for recording the eclipse, as well as “A”s accurate time display at the start and end of “B”s recording. 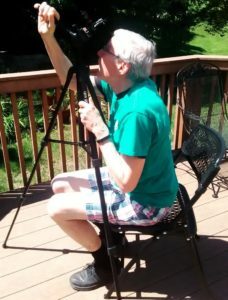 If there are two people at your site, one will operate smart phone “B” to record the eclipse; then the other person, who makes sure that smart phone “A”s time display is good before and after the eclipse, is free to watch the short total eclipse visually, like many did at past eclipses. Visual Observation: We would like the “A” person to call out when they think the last bead of light disappears for the start of totality, called 2nd contact, and when they think the first bead of bright light, marking the end of totality (3rd contact), starts to reappear; these voiced calls, recorded with the audio of smart phone “B”, can be compared with the video that “B” actually records. Although you will be able to see the corona for a much longer time, the total phase of the eclipse will last less than 40 seconds, and possibly only a few seconds, in the graze zone; at some locations, there might not be any real totality, with one bead starting to reappear just before the last one on the other side disappears. There will also be a color change of the last beads, from the dazzling white of the photosphere to the pink or red color of the chromosphere, the fainter layer above the Sun’s surface that will remain visible throughout totality for those in the graze zone. Smart phone accurate time apps: The apps that we recommend for smart phone “A” is “Emerald Time” for iPhones and “Smart Time Sync” for Androids. For the latter, touch the “GPS” button in the upper left and soon the “Source Status” will say in green letters, “On. Fixed now”. Our tests show that the “Source time” displayed in bold numbers is accurate to within 0.2s. Ignore the “Device time” below it; it is the cell phone’s time, that you will see is usually several seconds different from the accurate “Source time”. In some of the YouTube videos, I show use of “Internet” time rather than “GPS” time, but “Internet” time, while it can be more accurate with wifi access, is not as reliable as “GPS” time. The “GPS” time does need a reasonable view of the sky (GPS satellites), which you need in any case to see the eclipse. Some important cautions for smart phone “B”. Its flash should be turned off. On my Android, that is accomplished by entering camera mode and swiping my finger to the right, which brings up a menu on a semi-circle on the left side. Touch the lightning symbol, the second from the top. It gives 3 options under “FLASH”, the default is “Auto”. Change it to “Off” by touching “Off”, and now an annoying light will not come on as it gets dark during the eclipse. Another caution is that smart phone “B” should have enough storage for the eclipse video recording, which may be as long as 3 minutes. Open “Settings”, touch “More”, and move the menu up so that you can see “Storage”, which is the second item below “Sound”. Touching “Storage” will give a display of used and “Available” (or free) space; it may take several seconds for your phone to calculate it. You need to have at least 0.50GB available before recording the eclipse. Check this a day or so before the eclipse, so you can download old photos and videos from your phone gallery to your computer, and then delete them from your smart phone. Hopefully, that will free up more than enough storage so you don’t need to remove any old apps. And perhaps most important, make sure that your smart phone (or both of them) are fully charged before the eclipse. It is recommended that the “B” phone operate in airplane mode during the recording; then it can’t be interrupted by an unwanted phone call or text message around the critical time. But smart phone “A” should not be in airplane mode, since it needs cell phone and GPS signals for its timing app to work. And “B” should not be in airplane mode if/when it is used to take the location-tagged pictures, since the location tagging won’t work in airplane mode. Your smart phone lens should be clean; check it with a plain background view, not too bright, to see if there are any blurs caused by dust or other material. If you see any, wipe the lens gently with a lens-cleaning cloth. IOTA highly recommends that you purchase a small smart phone telephoto lens available for about $10 via Amazon or Walmart; this will give a magnified view of the eclipse and Baily’s beads that will be better for our analysis. We recommend 8X-12X Zoom Cellphone Camera Lens available here (The Web site says “for iPhone and Samsung Galaxy” but it works fine also with my Android; the unit that I received is 12X). 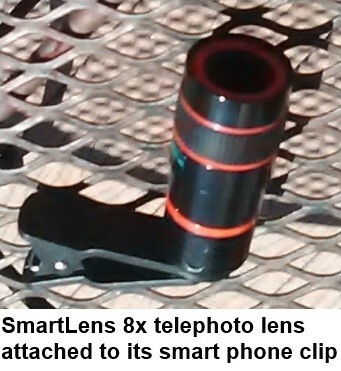 Also useful is a Smart-Lens telephoto zoom lens available from Walmart but it gives 8X, so less magnification. 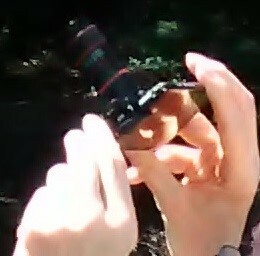 Other similar smart phone telephoto lenses can also be used; anything giving more magnification helps. The telephoto lens will also help you take pictures of the partial phases of the eclipse; IOTA does not collect such images, but if you want to try to take some, we recommend 2 or more layers of “space blanket” (available at most sporting goods stores, or sporting goods sections of stores like Walmart) mylar to cover the lens (but ONLY during the partial phases); the eclipse glass filters, although great for visually following the progress of the eclipse, may be too strong for smart phones. Video of the partial phase is not recommended due to storage limitations on your smart phone. Taking some partial phase still pictures is useful for practice, to see the Sun in your smart phone display; its image will be overexposed, just a fuzzy blob, but seeing it will confirm that you’re pointed at the Sun. During the partial phases, you can image a sharper, better focused view if you cover your smart phone lens with pieces of mylar cut from a space blanket. During the minutes before the total eclipse, the Sun will become a narrow crescent of decreasing brilliance that will become increasingly easy for your smart phone to focus on. The above method requires at least smart phone B to be held towards the Sun during the eclipse. 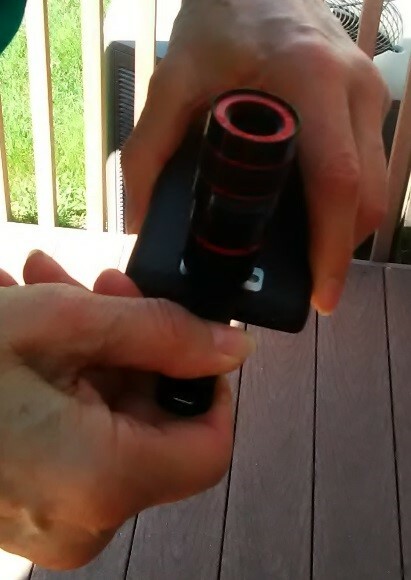 A steadier recording can be obtained if the phone is not hand-held, and then the person operating phone B is also free to observe the short total eclipse. There are two ways to do this, one using a tripod described in more detail here (this is recommended, if a suitable tripod is available, especially when using one of the telephoto lenses described in the previous section) and the other using a wedge or other device to prop the smart phone at the right angle to image the Sun, described here .